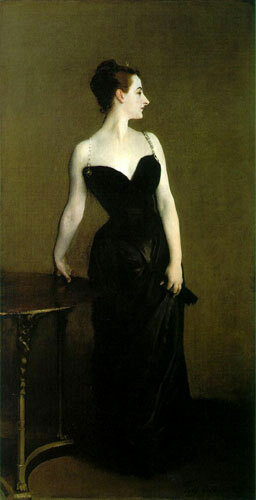 "Madame Pierre Gautreau (Madame X)"
When Madame X was shown at the Salon of 1884 it instantly became a scandal in French society as a result of the sexual suggestiveness of the Madame's pose, the pale pasty color of her skin and the reddish pink of her ear. The doors of the Salon were hardly open before the picture was damned. The onslaught was led by the Madame's relatives. A demand was made that the picture be withdrawn. If the picture was not withdrawn the family planned to wait until the Salon closed, take the painting and destroy it. Anticipating this, Sargent, before the exhibition was over, took it away himself. Madame Gautreau's reputation was apparently destroyed and John left France shortly thereafter, never to truly regain his former standing as the darling of Paris. After remaining many years in his studio, the portrait now figures as one of the glories of the Metropolitan Museum in New York.